How to pray the Chaplet of Divine Mercy. The Novena of Divine Mercy begins on Good Friday and ends on the Saturday after Easter, or Easter Saturday. At Sacred Heart Parish we will pray the novena after the Liturgy of the Lord’s Passion (3:00 pm) on Good Friday, and before every Mass from the Easter Vigil to Easter Saturday. We will also pray the novena at 7:00 pm in the Church from April 2 to 6. 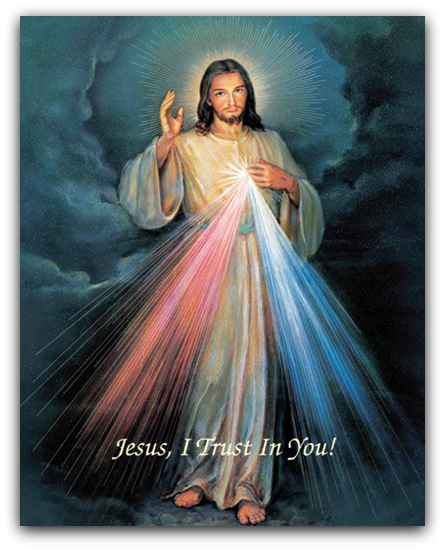 How to pray the Divine Mercy Novena. Regular Mass schedule for at 8:30 and 11:00 am. All Faith Formation Families and Parishioners are invited to our final event of the year. After 3:00 pm Mass, we will be having a Pot Luck Supper in the Parish Center Cafeteria. After Supper, Fr. Bob will share a reflection on the meaning of Divine Mercy and the importance of living its message.